3M pouch tape pads make attaching shipping papers to packages easy as you are walking around a warehouse. 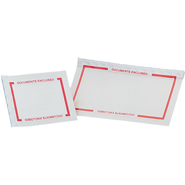 Convenient, dispenserless 3M ScotchPad Pouch Tape Pads are designed to protect address labels and packing lists. They keep your shipping documents clean, legible, and attractive, thus helping to ensure packages reach their destination. Easy to use pre-cut individual sheets. Aggressive adhesive provides excellent adhesion to various surfaces. ScotchPad Pouch tape pads are portable, lightweight, and space-saving.